We are involved in manufacturing & supplying nickel plated brass glands which are used for unarmored PVC, XLPE and other synthetic cables. Made of high graded brass with nickel plating make them strain proof, corrosion resistant and highly efficient. We offer these products at most cost competitive price. We have expertise in manufacturing & supplying nickel plated brass glands which are used for unarmored PVC, XLPE and other synthetic cables. These are fabricated form bras nickel plating, polyamide and neoprene materials which are resistant against chemical resistance and weather condition. 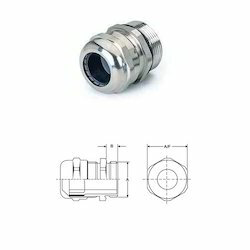 Looking for Nickel Plated Brass Gland - IP68 Rating - Metric Thread ?